A new mixed-use commercial development in Miami’s Design District broke ground this morning, The Real Deal has learned. 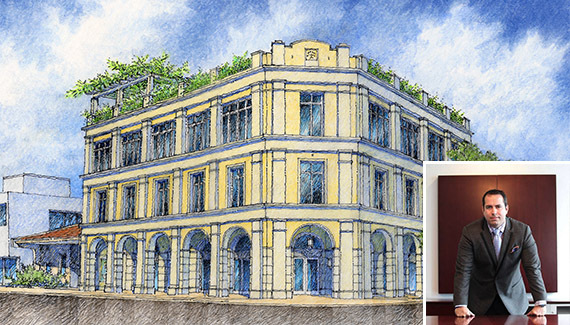 The Mediterranean-style building, at 4136 North Miami Avenue, will stand out in an area that has been transformed into an ultra-luxury and ultra-modern retail destination, developer Manny Angelo Varas said. Varas said the project will include a 1,692-square-foot ground floor retail space, and second and third-floor office space ranging from 1,500 to 6,978 square feet. When completed, it will also include a rooftop deck for tenants and events, and underground parking for 26 cars. Rents will start at $35 per square foot for office space, and $75 triple net per square foot for the ground level. Varas, who said he’s received interest from national retailers, expects to have tenants in the building by next September. Tony Arellano of Metro 1 is the exclusive leasing agent. An LLC led by Ana Bravo and Roberto Bravo own the 9,400-square-foot site, according to Miami-Dade property records. They also own the building across the street, at 4141 North Miami Avenue. Nearby retail includes Natuzzi Furniture, Louis Vuitton, Versace and Tom Ford. Miami-based MV Construction & Interiors Group, a construction, architecture and interior design firm, works on condos, single-family homes and commercial properties.